Where I’m from, most politicians only spring into action when it’s time for re-elections. Other than that, they’re busy plastering their faces on signs and tarpaulins of ongoing projects all around the city while failing to do what they’re really supposed to do: serve. Apparently, Russian’s politicians do that too. The condition of a lot of roads in Yekaterinburg, Russia was pretty bad and all the potholes were starting to get on people’s nerves. It got so bad that a local blog, URA.RU, took things into their own hands. 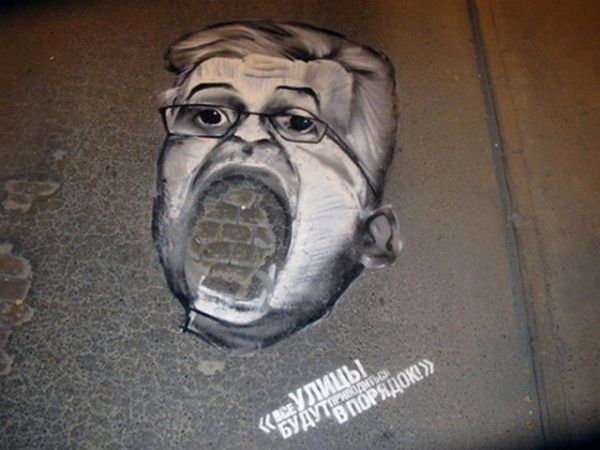 In the dead of night, they tasked Voshkod, an agency, to draw caricatures of the officials’ faces on the pockmarked streets, with their mouths right over the potholes. And to make a long story short, their stunt actually worked, with work on the roads beginning shortly afterwards. Now this is street activism.